Ben Ainslie has spoken exclusively to Boat International about Bermuda hosting the America’s Cup in 2017, expressing his delight. As a Boat International columnist, Ben Ainslie writes about his personal connection with Bermuda in the February issue, on sale mid-January. “We have close ties to the island and we will be using those to make sure we do the best possible job of providing ourselves with the facilities that we need,” he said. 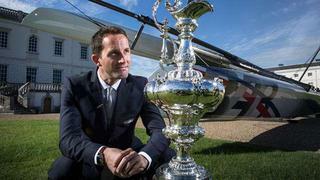 Details of the Amercia’s Cup host follows the announcement that two America’s Cup World Series events will be held in Portsmouth in July 2015 and 2016. These events will be managed by a team set up by Sir Keith Mills, who was Deputy Chairman of the London 2012 Olympics, Chairman of the recent Invictus Games and is one of the investors in Ben Ainslie Racing. Follow Ben Ainslie’s America’s Cup bid in the new issue of Boat International, on sale Thursday, in which he gives detail of the team’s test boat and discusses what they need from a foiling boat in order to win.